VATICAN CITY — It begins with prayers chanted in an ancient language and ends with a tiny figure on the balcony of St. Peter’s Basilica unveiled as the supreme pontiff of more than a billion Catholics. 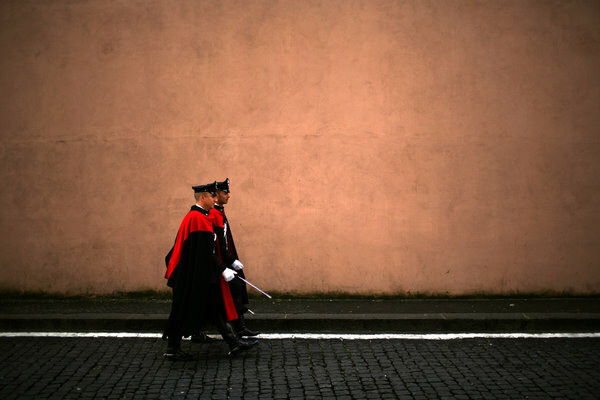 The conclave to elect a pope, which starts Tuesday, unfolds with elaborate ritual, deep secrecy and politicking that would warm the heart of a machine politician. The voting is minutely scripted. Rectangular paper ballots are counted, collected, pierced with a needle and burned. Exactly four rounds of voting are permitted each day. The winner’s name is intoned in Latin. It is a process dating back centuries, with a rich history of chicanery — like the bought election of Julius II in 1503 and the undermining of a leading contender, Cardinal Giuseppe Siri, in 1978, thanks to the leaking of an embargoed interview he gave. The first ballot, expected late Tuesday afternoon, serves effectively as a primary. It identifies the cardinals to whom votes can flow in succeeding rounds — two every morning, two every afternoon. “I expect the first vote is going to be quite scattered around,” said Cardinal Wilfrid Fox Napier of South Africa, given “the wider field of candidates with the potential” to become pope. While the Holy Spirit is supposed to be the guiding light behind a pope’s selection, the cardinals are known to negotiate between the ritualistic voting rounds over dinner and coffee, although the constitution governing papal transitions forbids them from making deals. The conclave that elected Cardinal Joseph Ratzinger in 2005 as Benedict XVI lends some insight into how the voting progresses. In 2005, Cardinal Ratzinger jumped out to a quick lead with 47 votes, according to the diary of an unnamed cardinal, as reported by an Italian state television journalist, Lucio Brunelli, in the journal Limes later that year. While never verified, the outline of Mr. Brunelli’s version was reflected in other accounts. The diarist said Cardinal Jorge Mario Bergoglio, the archbishop of Buenos Aires, received 10 votes; Cardinal Carlo Maria Martini, the archbishop of Milan who was considered a less conservative choice, received 9; and four others held several votes. Many Vatican experts said that Cardinal Martini was not necessarily considered a real option, but a gathering point for anti-Ratzinger votes. In the second round, Cardinal Ratzinger’s count rose to 65 and Cardinal Bergoglio’s to 35, the diarist said, according to Mr. Brunelli. Cardinal Ratzinger appeared to have picked up the 6 votes of Cardinal Camillo Ruini and 12 scattered votes. Cardinal Martini’s votes apparently went to Cardinal Bergoglio. Round 3: Cardinal Ratzinger, 72; Cardinal Bergoglio, 40. At this point, Cardinal Bergoglio needed only four votes to exceed one-third of the total, enough to block a Ratzinger papacy. “Great worry among the prelates who hope for the election of Cardinal Ratzinger; contacts grow thicker,” Mr. Brunelli reported the diarist as writing. But on the fourth round, at least 12 went to Cardinal Ratzinger, giving him 84 and the papacy. In an effort to limit the release of such inside information, the extras to the drama are sworn to secrecy, on pain of excommunication. The secretary of the College of Cardinals, priests for cardinal confessions, doctors, nurses, elevator operators, security officers, cleaning and meal crews and minibus drivers who all serve the cardinals — all took the oath on Monday in the Pauline Chapel in the Apostolic Palace. They numbered about 90.